Canada's High Commissioner to Tanzania, Alexandre Lévêque, hands over a symbolic cheque to Vicky Ntetema, Executive Director of Under The Same Sun's Tanzania Chapter, in Dar Es Salaam to show Canada's support for the radio project. Tanzania has one of the highest prevalence rates of albinism in the world. Some scientific estimates suggest as many as one in 2,000 Tanzanians have albinism, a genetic condition in which no melanin is produced in the skin, hair and eyes. This is compared to one in 20,000 in North America and Europe. Although actual census data does not exist, this means that as many as 20,000-25,000 Tanzanians could have albinism. People with albinism in Tanzania face discrimination and social exclusion and they are the target of horrific violence. According to the Office of the United Nations High Commissioner for Human Rights, 72 murders of people with albinism have been documented in Tanzania since 2000, with hundreds of others suffering horrendous amputations and serious injuries. In a two-week period in February 2013, a seven year old boy with albinism and his 97 year old grandfather, who was seeking to save his loved one, were murdered; three more, including a seven-month old baby, were mutilated. This violence against people with albinism results from archaic and inhumane witchcraft beliefs, particularly prevalent in the northern part of Tanzania. Traditional healers and witchdoctors have perpetuated the myth that obtaining the body parts of people with albinism can bring good fortune, strong powers and enhanced wealth. This also means that graves of people with albinism have been vandalized and robbed. 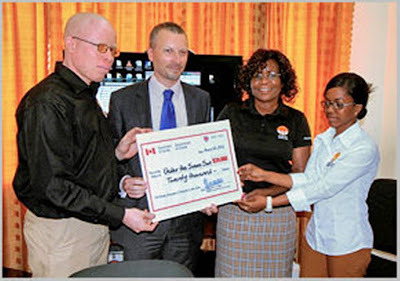 Under the Same Sun (UTSS), a Canadian non-governmental organization dedicated to assisting people with albinism, opened a branch in Tanzania in 2010. Since then, UTSS has been playing a vital role in educating the Tanzanian public about albinism, its causes, and the challenges faced by people with albinism in Tanzania, with the long-term objective of preventing discrimination and violence and offering better education and livelihood opportunities. UTSS and Canada share the belief that people with albinism can take their rightful place as equals in Tanzanian society, and are working hand in hand to transform attitudes vis-à-vis albinism so that lasting change can be achieved. With the support of CAD $20,000 from the Canada Fund for Local Initiatives, UTSS produced radio documentaries and radio dramas, using some of Tanzania’s most well-known actors, like King Majuto and Bi Chau. The broadcasts will be aired across the northern regions of Tanzania on community radio stations for the next six to twelve months. Canada’s Parliament also called upon the Tanzanian Government to prosecute actively and aggressively, and convict all perpetrators of these crimes. In light of the recent spate of attacks, effective prosecution becomes even more important as a deterrent to future atrocities. The radio shows are intended to build knowledge amongst members of the public about albinism, strengthen ties between people with albinism and their communities, and encourage interaction and understanding. The hope is that these radio broadcasts will contribute to ending once and for all violence and discrimination against people with albinism in Tanzania. The Canadian High Commission in Tanzania will continue to monitor this issue very closely and to support ongoing efforts by UTSS to transform attitudes toward albinism.